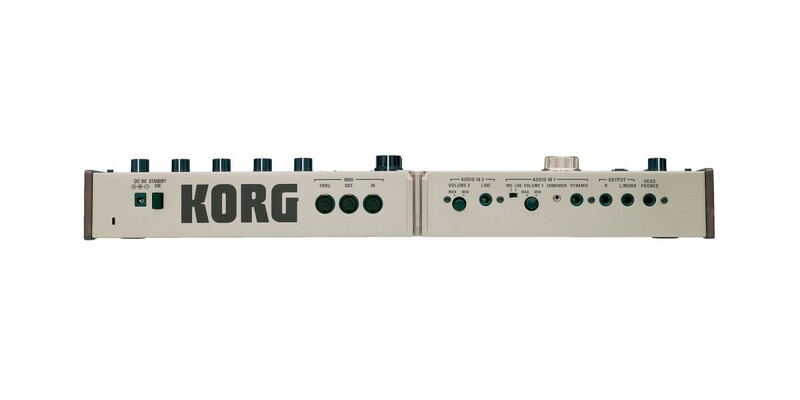 Serious synthesizer and vocoder functionality in a compact package — the microKORG. 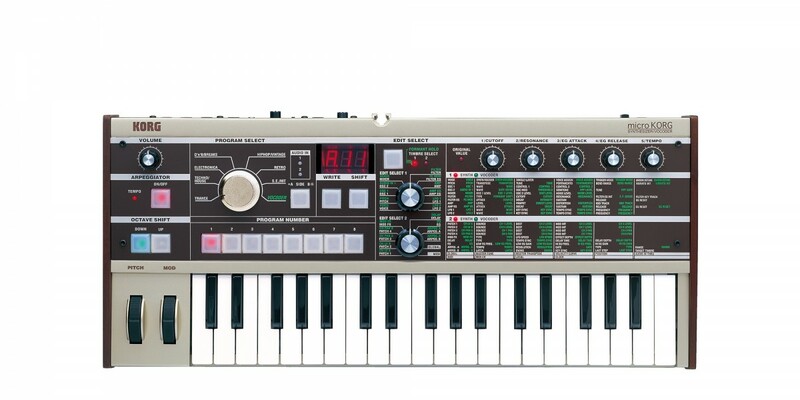 In 2012, the microKORG celebrated its 10th birthday. 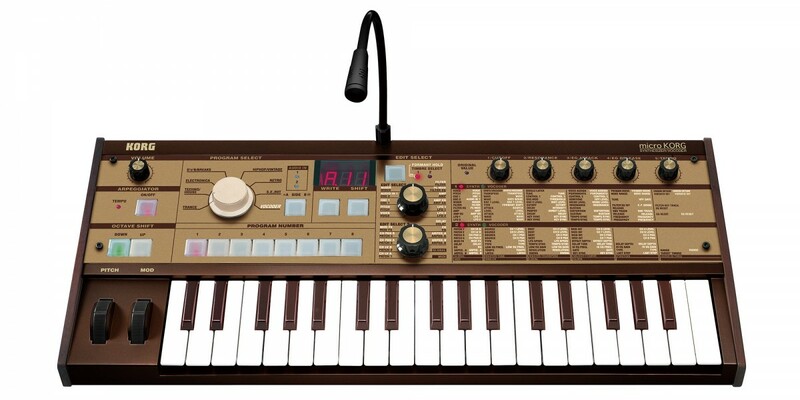 Now in 2013, to commemorate Korg’s 50th anniversary, the microKORG is now available in a new, limited edition, Gold! 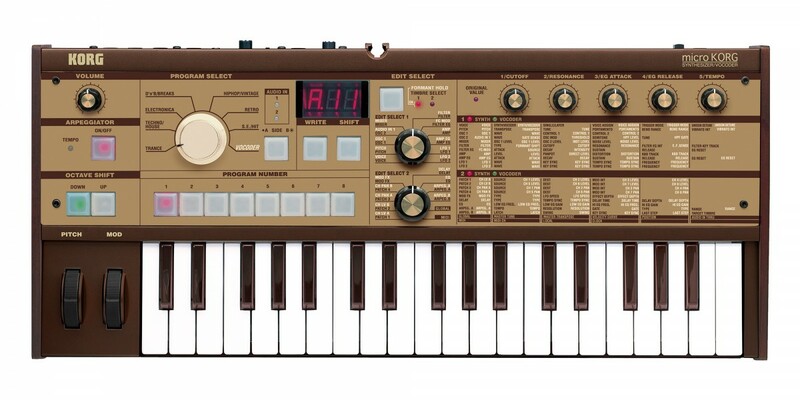 The microKORG-GD (gold) boasts the most gorgeous exterior in the history of the microKORG. Quantity is limited to 2,000 units world-wide. The microKORG is a serious yet compact synthesizer with a strong personality, designed to give you the true enjoyment of creating sounds. The tone generator features the same DSP analog modeling system as the MS-2000 – which has been acclaimed by musicians for its warmth and broad range of sounds. Offering a wide selection of waveforms, the microKORG offers powerful filters, envelopes, LFOs, effects and modulation possibilities to help you shape the sounds you want. 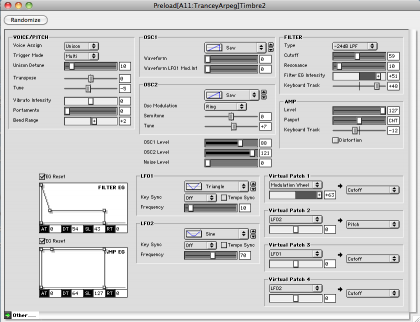 You can edit the sound easily and intuitively, simply by selecting parameters and turning knobs. 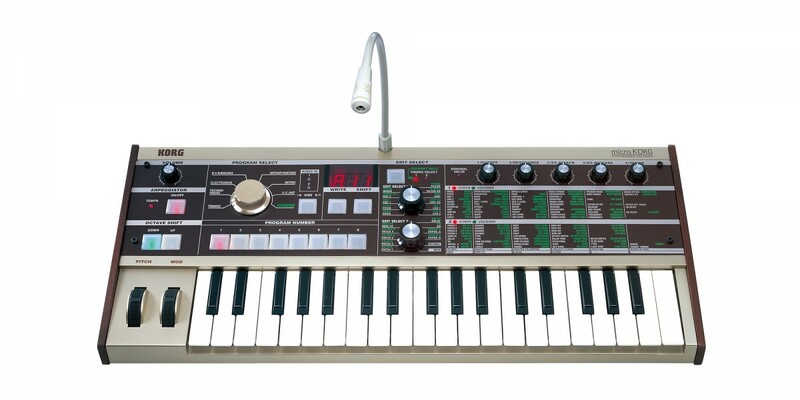 Since it’s easy to modify the sound in realtime, the microKORG can play a role in a wide variety of situations ranging from live performance, to recording, to computer control. 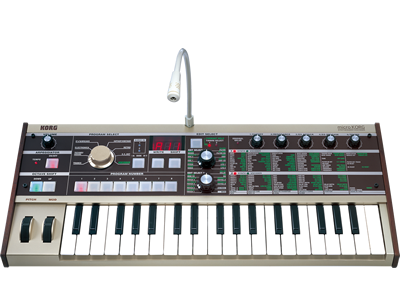 Each voice of the microKORG consists of two oscillators (OSC1 and OSC2). OSC1 provides basic analog waveforms such as sawtooth wave, square wave, and sine wave, as well as VOX Wave (human voice formats) and 64 DWGS waveforms from Korg’s classic DW-8000 digital synthesizer. 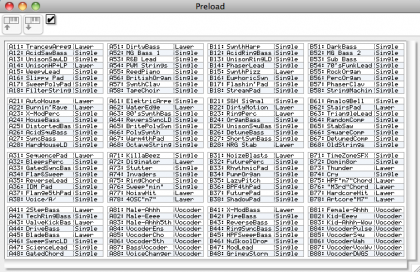 This is a total of 71 possible selections, more than any other modeling synthesizer! Many of these waves can be further shaped to produce classic effects like pulse width modulation, FM and other forms of waveshaping. By applying ring- or sync-modulation from OSC2 with its three basic analog waveforms, you can easily create extremely complex sounds that would be impossible using just a single oscillator. 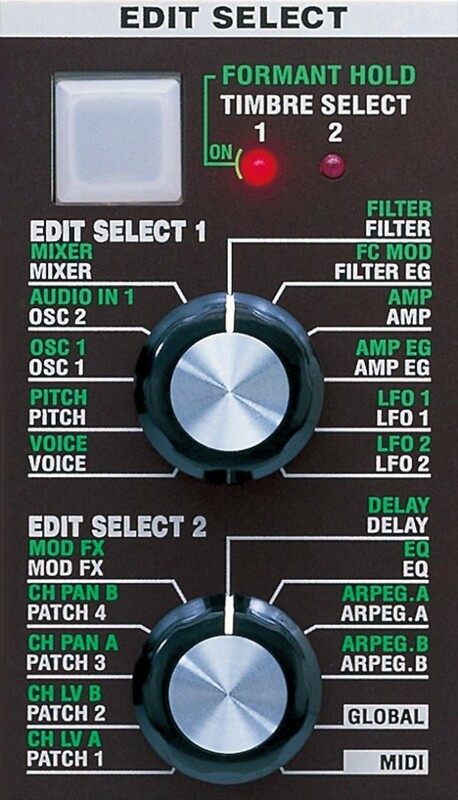 An external audio input can be used to route audio into the microKorg and process it with the filter and effects sections. The multi-mode filter of the microKORG lets you choose from two types of low-pass filter (-12 dB/-24 dB), a band-pass, or a high-pass filter. Filter resonance can be adjusted to emphasize a frequency peak, and will self-oscillate if desired. These extremely sharp filters give you the versatility to create any tone from traditional fat sounds to cutting dance sounds. 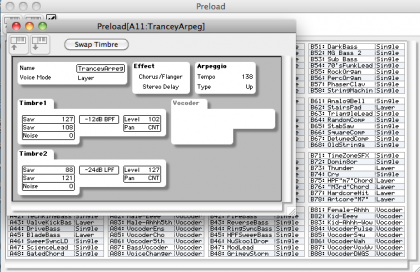 The amp section allows you to shape the volume of the sound over time. In addition to adjustable volume and pan, you can switch a powerful distortion on/off. This can be used to add a distinctive “edge” to any sound, letting you produce extremely intense tones. The EG (Envelope Generator), which applies time-variant change to the sound parameters, is a classic ADSR design (Attack, Decay, Sustain, and Release), and can also be used as a modulation source. Two types of LFO (Low Frequency Oscillator) are provided, letting you apply cyclic modulation to the sound parameters. High-speed DSP processing ensures that vibrato, wah, and tremolo effects are produced very smoothly. The microKORG provides a virtual patch function which simulates the patching functionality of classic Korg synthesizers of the past such as the PS series and MS series, letting you specify four modulation routings. Each patch consists of a modulation source “SOURCE” , a modulation destination “DEST” , and a modulation intensity adjustment “MOD INT” . A modulation source or controller such as Filter EG, AMP EG, LFO 1/2, keyboard tracking, or wheel can be freely connected to a parameter such as pitch, cutoff or amp to create more flexible and sophisticated sounds. 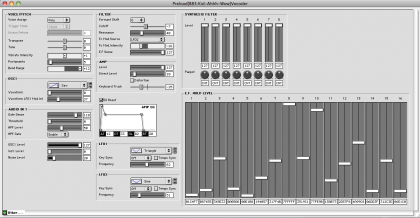 By using a USB cable to connect the microKORG to your computer and using the sound editor software, you can edit all of the parameters easily from your computer.